Description: Players must form words on an 8x8 (or in the newer editions 10x10) grid. The words may be formed horizontally or vertically on the grid, as in Scrabble, but as the title suggests the letters may also be stacked, so that words can be changed by having letters substituted by stacking (up to a limit of 5 high). Scoring is also different to Scrabble; there are no letter values; instead, when a new word is formed, the number of tiles used in that word is counted and used as the score. A word that is flat (no stacked tiles) scores double, but the words that score the most are those that have lots of stacking. Some editions come with number tiles to solve (included) Sudoku puzzles. Also known as Scrabble Upwords. 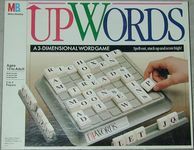 Upwords Deluxe has an 11 x 11 rotating grid, 121 tiles and 28 challenge tiles, and electronic timer.